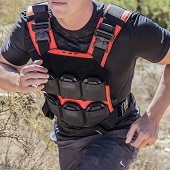 AR500 Armor® Side Body Armor is designed to be worn in side plate pouches which attach to a plate carrier system. Sized to fit most side plate pockets and MOLLE pouches on the market. Our side plates are available in 6" x 6", and 6" x 8". All AR500 Armor® Body Armor is 100% made in the USA and manufactured from our rugged and reliable ballistic core designed specifically for Armor applications.